In Germany most people bake cookies only for Christmas. And then they make tons and tons of them. Most of them are pretty simple to make and require only a few ingredients. Many are also different from US cookies. We like shortbread and spritz cookies. Cookies that are not soft and moist but rather crispy and tender. They are usually much smaller than North American cookies, too. Usually it’s the kids’ job to squeeze or cut out all these cookies and place them on cookie sheets over cookie sheets. We never did that at home and sometimes I think the reason why this blog is filled with so many baking recipes and childhood memories is the lack of baking in my childhood. Do I have issues? Probably. But it could be worse. So even though we never made this kind of cookies at home, I consider them the cookies of my childhood. I helped bake them at friends’ kitchens. I ate them at relatives’ places. And I ate tons of them because they were so delicious. They are tender and slightly delicate, not too sweet and with very mild roasting flavours from the lightly browned edges. They are cookies for every occasion and they can always be kept on hand. To make them a little bit more special, you can add a little something like a vanilla bean, lime peel, poppy seeds,… The possibilities are endless. For my version I chose coffee granules and as always I took the cookies to work to let my co-workers taste test. Two of them requested the recipe and thought they were great, “grown-up” cookies. But believe it or not, our 20 month old kid loved them, too. She likes to drink the leftovers in my espresso cups when I am not looking and she immediately recognized that there was coffee in these cookies, too. And then she ate two or three. Place almonds in a food processor or blender. Cut the vanilla bean into three to four pieces and add. Grind finely. With a hand-held blender, beat sugar and margarine until fluffy. Add flour, almonds, and espresso granules and beat until a crumbly dough has formed. Divide the dough into three portions. Form equally sized balls and roll each out (1/2 cm or 1/4 inch thick) between two sheets of plastic wrap. Remove the plastic and cut out the cookies. Do this carefully, the dough may be crumbly. Place on a baking sheet and bake for 5-6 minutes or until the edges turn golden. Let cool on a cookie sheet. Hubbie & I both love coffee so definitely trying these babies ! oh superyumfulness! I want to try these with vegan vanilla So Delicious to make ice cream sandwiches. Thank you for the recipe…cheers! I could definitely go for one of those RIGHT NOW. So funny that your daughter loves them. P.S. I didn’t realize you had a daughter, congrats!! Welcome to the world of creative parents who blog :-) It’s a different world, but a good world. Wow, this sounds incredibly easy and looks gourmet. I can never find vegan shortbread cookies in the stores so I definitely want to make these. I think that is terribly fantastic of you! We didn’t bake that much at home as kids either but I remember making these sugary peppermint things for school fairs and stained glass window biscuits (y’know the one’s with the melted boiled sweets?!) at Christmas. These look delicious, I’m not a fan of coffee as a drink but I loooove it in things! I didn’t really grow up making cookies at home either. Our usual homemade goodies were “rice krispie squares” and “fairy cakes” :) I did have an American neighbour who would invite me around before Christmas to help make and decorate hundreds of sugar cookies! 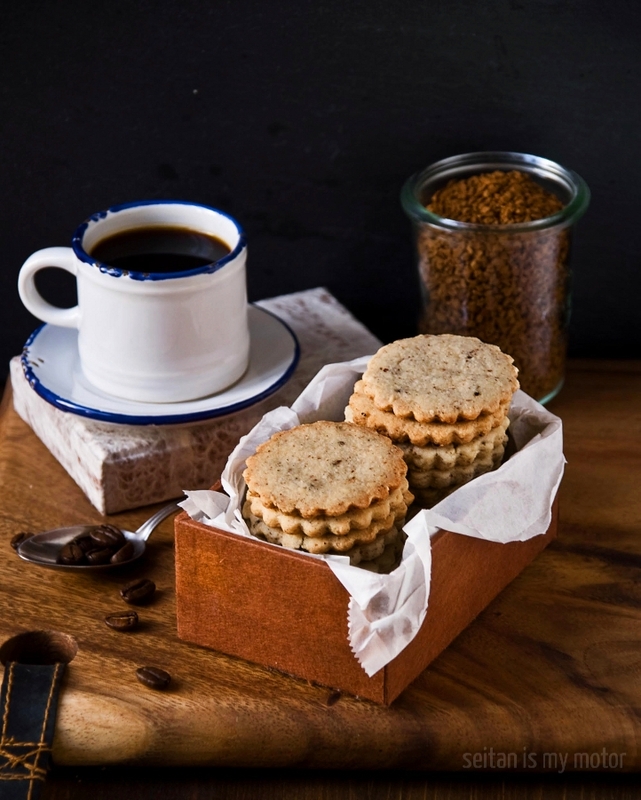 I don’t like coffee to drink but I definitely do when it’s in a sweet treat like these cute little shortbread. These cookies look delicious and I am always ready to try a new cookie recipe. My mom is German and she used to bake German butter cookies every Christmas! Can I borrow your mom next Christmas?